360-acre tract certified as shovel ready by Louisiana Department of Economic Development and McCallum Sweeney Consulting as part of Cleco’s Smartsites program. Zoned Heavy Industrial. Studies completed include Environmental Site Assessment, Phase 1, Geotechnical Investigation, Threatened and Endangered Species Study, Archeological/Historical Investigation and Wetlands Delineation. Over 4,000 feet of frontage on the Kansas City Southern Railroad and U.S. Highways 71 and 84. 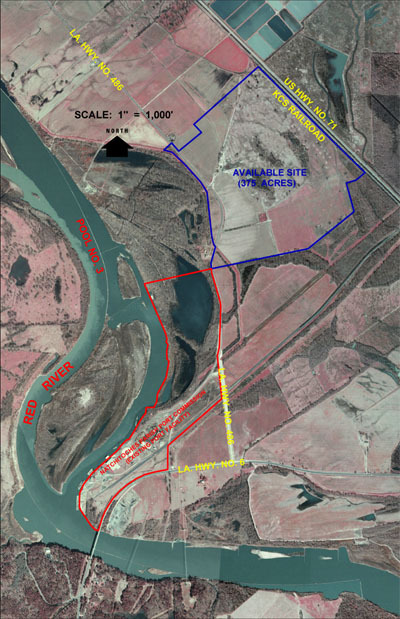 Direct access to Natchitoches Parish Port on Red River. For additional information about the North Port Tract or the Natchitoches Parish Port, please contact our office.